Hawaii County officials have issued an alert over dangerous levels of sulfur dioxide gas rising from fissures in the ground caused by an eruption of a volcano on one of Hawaii’s islands. The air quality in the Lanipuna Gardens subdivision has been evaluated as a “condition red,” which means the air could pose an immediate danger. The volcanic gases are mostly water vapor, carbon dioxide and sulfur dioxide. The sulfur dioxide can react with water to form acid, so if you breathe it in, you can damage your lungs, throat and nose and irritate your eyes. If the vapor is particularly dense, it could kill you. The gases are especially dangerous for the elderly, children, babies and people with respiratory problems. The Kilauea volcano erupted in the southeast part of the Big Island on May 3. The volcano is one of the most active in the world. The Hawaii Volcano Observatory is perched on the rim of Kīlauea’s summit caldera. At least 19 fissures have cracked open since Kilauea volcano erupted. Fissure 17 is the most active, shooting lava like a fountain more than 100 feet into the air. Scorching lava has already destroyed 37 structures and dozens of vehicles. The Hawaii State Department of Health is asking the general public to avoid any area with fissures. Officials have also urged residents to minimize their exposure to ash in the area. Excessive exposure to ash can irritate the eyes and respiratory system. 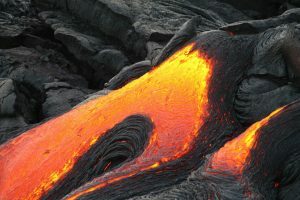 There are also concerns about phreatic eruptions, steam-driven explosions that occur when water beneath the ground or on the surface is heated by intense heat. Officials with the US Geological Survey said a phreatic eruption could send ash plumes as far as 12 miles from the crater. Increasing the chances for a phreatic explosion, the lava lake in the summit crater of the volcano has been dropping since May 2. President Trump declared a major disaster in Hawaii following a request by the state’s governor. The order will make federal funding available to supplement state and local recovery efforts.